Traditional folding table and bench sets, design sets or poseur tables – here, you’ll find the perfect solution for your requirements! 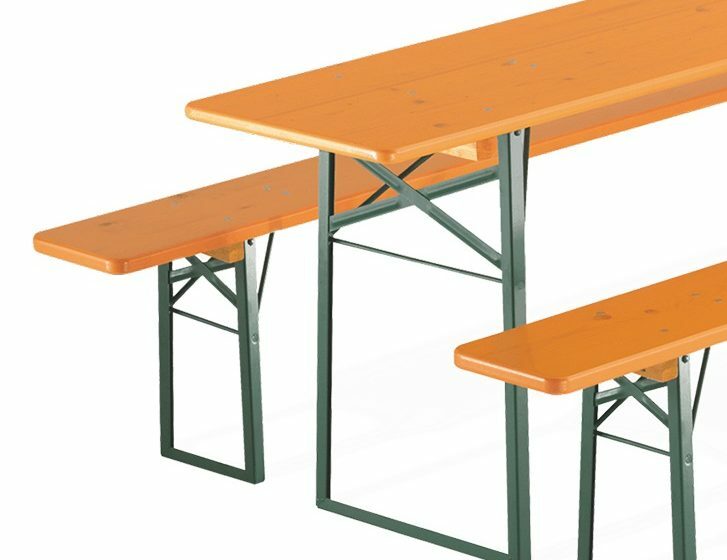 Our product range offers the perfect folding table and bench set for you – in brewery standards. Choose between tables with or without extra legroom and combine them with beer benches with or without backrests. Of course, our folding tables and benches are available separately as well. The original RUKU folding benches and tables – the classic. Tables with or without extra legroom and beer benches with or without backrests offer countless combinations to create your perfect furniture set. All folding tables and benches are available in various sizes and colour. The RUKU furniture line “Shorty” comes into play when space is tight. It is ideal for balconies and offers comfortable seating for 4 persons. Despite the length, both folding tables and benches remain foldable – just as the original RUKU beer tent set. The little ones can party like their elders with “Bambini” furniture! The original RUKU party tent furniture is now available in miniature: table and bench are 110 cm long and 40 and 20 cm wide respectively. While our design set “Rustica” convinces due to its classical, rustic style, the desing set “Lago” scores with its minimalist design. Aesthetic pure wood set of folding benches and tables – furniture just like 60 years ago. Wide sitting areas and optionally available backrests ensure best comfort.. The RUKU table and bench set for special occasions! The design set “Lago”, made from solid oak wood, shows that design and functionality match perfectly. With digital printing, there will be no limits to your creativity. Large-scale logos and even whole photographs can be printed onto your folding table and bench set. As an advertising medium at trade fairs, events or at your company party – individually printed folding furniture sets are always an eye-catcher. Turn your folding table and bench set into an absolute highlight. Personalise your table and bench set according to your wishes and benefit from many years of printing experience and the quality of RUKU folding furniture. The Shorty furniture set is the optimum solution when space is tight. With the right printing, this short table and bench set will be the star in small locations. The RUKU poseur tables are available in different versions – the range incluldes the poseur table “Unbreakable” and the somewhat larger “200×60” cm poseur table. The RUKU “200×60” poseur table can be used as a classic bar table or as a mobile counter. Its two-metre long, sturdy spruce tabletop provides plenty of room for serving beverages. The RUKU “Unbreakable” poseur table stands up to wind and weather. The rust-free, stainless steel folding model has an especially robust and strudy frame. Even scrapes and knocks won’t leave a mark on the high-quality tabletop of PE 500 plastic.